1. I will not play at tug o’ war. I’d rather play at hug o’ war, Where everyone hugs Instead of tugs, Where everyone giggles And rolls on the rug, Where everyone kisses, And everyone grins, And everyone cuddles, And everyone wins. 2. How many slams in an old screen door? Depends how loud you shut it. How many slices in a bread? Depends how thin you cut it. How much good inside a day? Depends how good you live ’em. How much love inside a friend? Depends how much you give ’em. 3. Ricky was “L” but he’s home with the flu, Lizzie, our “O,” had some homework to do, Mitchell, “E” prob’ly got lost on the way, So I’m all of love that could make it today. 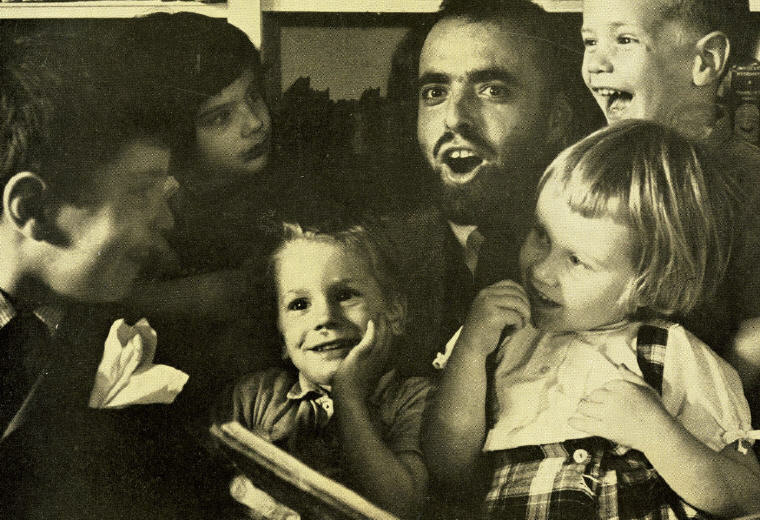 Excerpt from Wikipedia: Sheldon Allan “Shel” Silverstein (September 25, 1930 – May 8/9, 1999), was an American poet, singer-songwriter, musician, composer, cartoonist, screenwriter and author of children’s books. He styled himself as Uncle Shelby in his children’s books. Translated into more than 30 languages, his books have sold over 20 million copies. 1. Tell me I’m clever, Tell me I’m kind, Tell me I’m talented, Tell me I’m cute, Tell me I’m sensitive, Graceful and wise, Tell me I’m perfect– But tell me the truth. 2. There is a voice inside of you that whispers all day long, “I feel that this is right for me, I know that this is wrong.” No teacher, preacher, parent, friend or wise man can decide what’s right for you — just listen to the voice that speaks inside. 3. All The Woulda-Coulda-Shouldas Layin’ In The Sun, Talkin’ ‘Bout The Things They Woulda-Coulda-Shoulda Done … But All Those Woulda-Coulda-Shouldas All Ran Away And Hid From One Little Did. 4. This bridge will only take you halfway there to those mysterious lands you long to see: Through gypsy camps and swirling Arab fairs and moonlit woods where unicorns run free. So come and walk awhile with me and share the twisting trails and wondrous worlds I’ve known. But this bridge only take you halfway the—The last few steps you’ll have to take alone. 5. Listen to the MUSTN’TS, child, Listen to the DON’TS Listen to the SHOULDN’TS The IMPOSSIBLES, the WON’TS Listen to the NEVER HAVES Then listen close to me-Anything can happen, child, ANYTHING can be. 7. Oh, if you’re a bird, be an early bird and catch the worm for your breakfast plate. If you’re a bird, be an early early bird – But if you’re a worm, sleep late. 9. I believe that if you don’t want to do anything, then sit there and don’t do it, but don’t expect people to hand you a corn beef sandwich and wash your socks for you and unzip your fly for you. 10. Thanksgiving dinner’s sad and thankless Christmas dinner’s dark and blue When you stop and try to see it from the turkey’s point of view. Sunday dinner isn’t sunny Easter feasts are just bad luck When you see it from the viewpoint of a chicken or a duck. Oh how I once loved tuna salad Pork and lobsters, lamb chops too. Till I stopped and looked at dinner from the dinner’s point of view. #11 Aardvark Interview: Does a satirist have an obligation to society? 11. He has the obligation to society that any human being has. I don’t think a satirist has any greater obligation to society than a bricklayer or anybody else. #12 Aardvark Interview: Do you think we’re entering into an age of satire? Is there more freedom today for the satirist to express himself? 12. If you’re behind the times, they won’t notice you. If you’re right in tune with them, you’re no better than they are, so they won’t care much for you. Be just a little ahead of them. #13 Aardvark Interview: When you were on one of the TV discussion shows in Chicago, you were one of the only two people to speak out against the bookburners. It seemed that you didn’t have a chance to say everything that you wanted to. 13. So, when I talk, what it amounts to is that I’m explaining my work, and I don’t believe a man should explain what he does. I believe he should do it and not explain it. Never explain what you do. It speaks for itself. You only muddle it by talking about it. 14. To me, freedom entitles you to do something, not to not do something. 15. You’d better get your laugh while you’re making your point, or you won’t be doing it very long. 16. I made myself a snowball, as perfect as could be. I thought I’d keep it as a pet, and let it sleep with me. I made it some pajamas, a pillow for its head. Then last night it ran away, but first it wet the bed. 17. I went to find the pot of gold that’s waiting where the rainbow ends. I searched and searched and searched and searched, and then–There it was, deep in the grass, Under an old and twisty bough. It’s mine, it’s mine, it’s mine at last…. What do I search for now? 18. I think if you’re a creative person, you should just go about your business, do your work, and not care about how it’s received. I never read reviews, because if you believe the good ones, you have to believe the bad ones, too. 19. Have you been to The Land of Happy, Where everyone’s happy all day, Where they joke and they sing Of the happiest things, And everything’s jolly and gay? There’s no one unhappy in Happy, There’s laughter and smiles galore. I have been to The Land of Happy-What a bore! Read ‘A Giving Tree‘ by Shel Silverstein.